The ClevaFoam? Toddler Pillow offers optimum comfort and support for your toddler. Research from Trinity College Dublin has found that using a Clevamama ClevaFoam pillow can help protect the round shape of your child?s head.The study found both lower stress distribution and lower strain energy density when using the Clevamama? ClevaFoam? pillow. 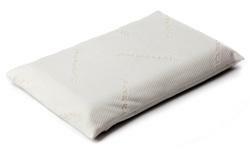 The pillow reduced the pressure on the child's cranium by almost 50 per cent, while providing more than 80 per cent more contact with the head. ClevaFoam? moulds to the contours of the child's head offering optimum support and pressure relief. The design of this pillow ensures that your child's head and spine is in the correct position and alignment. Perfect in size and design, the ClevaFoam? 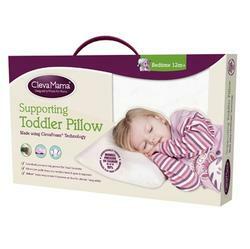 pillow supports your child?s head and neck for a peaceful slumber. Recommended Age : From 12 Months & Up.